Pre-registration deadline: Postmarked by Saturday, April 14, 2012. Receiving: Monday, May 7, 2012 from 9:00am-10:30am. 2012 RAC Studio Spring Classes! Lois Zebelman, Associate, has 3 paintings that were juried into the Bridge Gallery at the U of R office of mental health and 3 accepted into the Pittsford Art Group show at B and N.
Lennie Muscarella will be exhibiting at Keuka College Mar 12th—April 13. 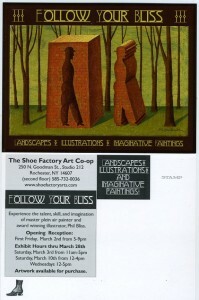 Reception March 22nd 4 to 7pm. Lenaria Brondum has been designated a master Silk Painter in the Silk Painters International. This designation is given by one’s peers in recogni-tion of the caliber of work done in this medium. Brondum, who is now enti-tled to use MSP after her name, will be acknowledged at the Silk Painters International festival in Santa Fe, New Mexico in 2012. Connie Mauro, Liz Durand and GA Sheller are presently having an Exhibition of their work, Interpretations 3 at the Geisel Gallery, One Bausch & Lomb until March 12, 2012. 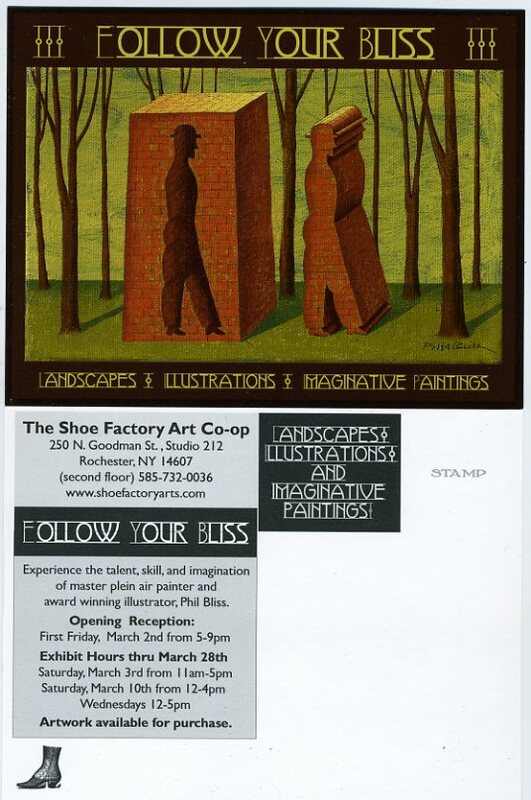 Phil Bliss will be having an exhibition of his work, Follow Your Bliss,At the Shoe Box Factory Co-op, 250 N.Goodman St. March 2nd—March 28th. Opening Reception First Friday March 2nd from 5-9 pm. Welcome to Our Newest Associate Affiliate Members: Nancy Lane, Nancy Murty, Laurence Keefe, Leslie Jacobs and Joni Monroe. By the way Joni Monroe’s late father, John Mack, was a former RAC member.